Benjamin Sabatier égrène au fil de l'alphabet les principes fondateurs de son travail. L'ouvrage est accompagnée d'une compression de canette, pièce unique signée. pendant 35 h, crée la structure de production d’oeuvres en kit IBK sur le modèle d’Ikéa, s’empare de l’histoire ouvrière ou déploie une oeuvre sculpturale marquée par une esthétique du chantier, il interroge de manière récurrente le concept de travail. Artist of action, Benjamin Sabatier insists in his social approach of art on the importance of "matter" and on the involvement of the viewer. He joined in it Marcel Duchamp and Joseph Beuys. Also spiritual son of Keith Haring and of the Support / Surface group, all these influences make his work unusual and exploding. 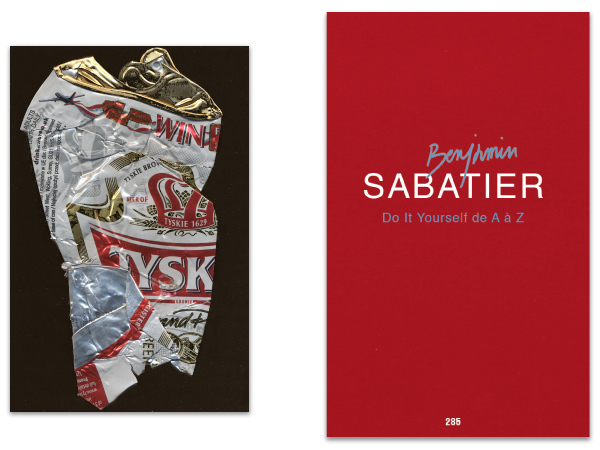 In Do It Yourself de A à Z, published by Editions Jannink in the collection "L'art en écrit", he shells over the alphabet the founding principles of his work. As he sizes of pencils during 35 h, creates the production structure of works in kit IBK based on Ikea's running, seizes labor history or deploys sculptural work marked by an aesthetic of the yard, he asked repeatedly the concept of work.